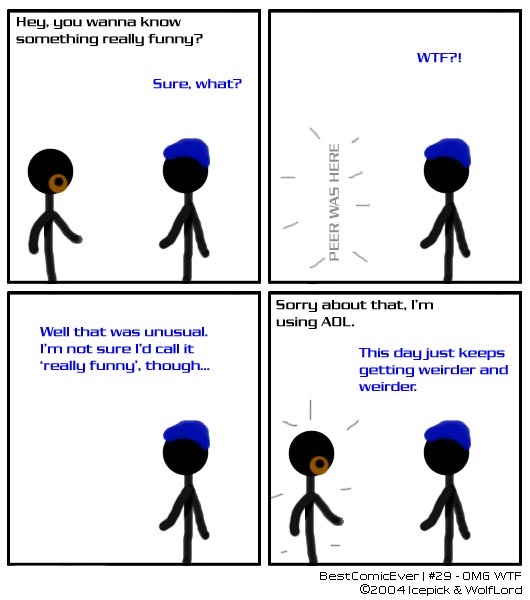 I actually came up for the idea a few weeks back when Wolf was fixing someones computer, and was connected via AOL, but I only got round to making it recently. It seems that quite a few people have been making BCE imitations (obviously, inferior ones, but that isn't the point), and if you have made one, you should head over to the Forums and post it for the rest of the world to see! There should be a new comic up now, but there isn't. Instead I refer you to the forums, where many insane gibbons have posted fancomics, or notfancomics; either way, there's some fun stuff to amuse yourself with. In a non-sexual way. I hope.